Vulcanic heated hoses are designed to maintain liquids or gases at a temperature of 5 to 350°C. Available from DN 6 to DN 25, up to 25 m.
Heated hoses are constructed from a PTFE or stainless steel smooth flexible hose onto which a heating element is wound. Silicone foam coated with a polyamide or stainless steel outer sheath provides insulation and protection of the flexible hose. As standard, the hoses are equipped at each end with a steel or stainless steel fitting, with rotating female nut (BSP cone 60°). Other fittings may be supplied on request. 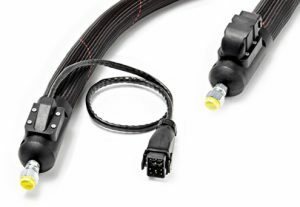 The temperature of the heated hoses is controlled by a choice of either a PT100 sensor or a thermocouple. They are connected electrically at one end by a flexible PTFE wire or equipped with a quick connector. Vulcanic heated hoses are designed and manufactured either as part of our standard range or as a customised solution (diameter, length, power, etc. ).